Don’t call it an HD remaster, ‘cause Prototype and Prototype 2 have been playing like this for years, sometimes better. It’s a sad state of affairs when a game runs better on the PlayStation 3 than it does on Xbox One. Released this past week with absolutely no fanfare whatsoever, the Prototype Biohazard Bundle for the PlayStation 4 and Xbox One bundles together both games in Radical Entertainment’s super anti-hero series, along with all corresponding downloadable content, all for the relatively steep price of $49.99. The full HD rendering rings true—both games do run at 1080p. This is a thing that they do. Higher-resolution textures and effects sound impressive, but that just means the original textures have been upscaled so they don’t look blown out in the enhanced resolution. Say your computer desktop is 720p, and you’ve got a desktop wallpaper to match. Switch to 1080p and that wallpaper will stretch and lose some fidelity. Downloading a 1080p version of the wallpaper fixes that, so your desktop looks basically the same. That’s what I’m seeing in the PlayStation 4 version of the games. Mind the 720p video. As for the framerate issue, Eurogamer’s Digital Foundry begs to differ. They held the Xbox One version up to the Xbox 360 and PlayStation 3 versions and found that in many cases the Xbox One’s framerate was actually worse. While I currently lack the means to measure framerate on the PS4 version, they feel a bit smoother than what I’m seeing in the video above, but not much. When there’s a ton of action on the screen it all goes to hell. In Prototype 2 for the PlayStation 4 I also encountered the issue with cutscenes stuttering when switching camera angles that Digital Foundry noted on the Xbox One. It makes one wonder why this bundle was released. With no marketing push, no forewarning outside of ESRB ratings and trophy information showing up early. Is Activision testing the waters for a new Prototype game? I sure hope not. I’d love a new game in the series, but this is like waving a moldy BLT in front of people’s faces to see if they’d like a new sandwich. I enjoyed both of the Prototype games (I was a huge fan of Radical’s Hulk: Ultimate Destruction), and I’m still getting a kick out of running up buildings and gliding through the city like a virus-infused flying squirrel. I imagine other fans of the series might get a similar kick out of having the two games readily accessible on their new-gen console dashboard. Just don’t expect a bigger, better experience—it’s the same thing, sometimes a bit slower. 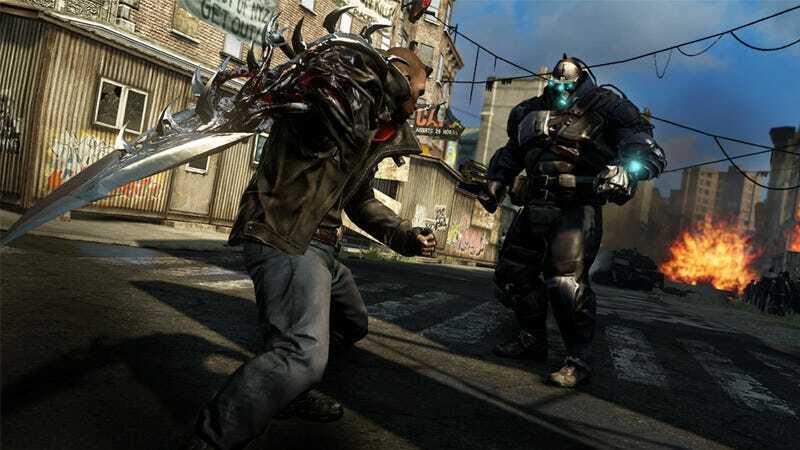 And should you not wish to spend $50 on both games, Activision will be releasing Prototype and Prototype 2 separately for the Xbox One and PlayStation 4 on November 11 for $29.99 and $39.99 respectively, because somehow that pricing made sense to someone.